Monarch Watch is a nonprofit education, conservation, and research program based at the University of Kansas that focuses on the monarch butterfly, its habitat, and its spectacular fall migration. Monarch Watch leads the largest tagging program where volunteers capture or rear monarchs and tag them with small stickers that have a unique identifier. 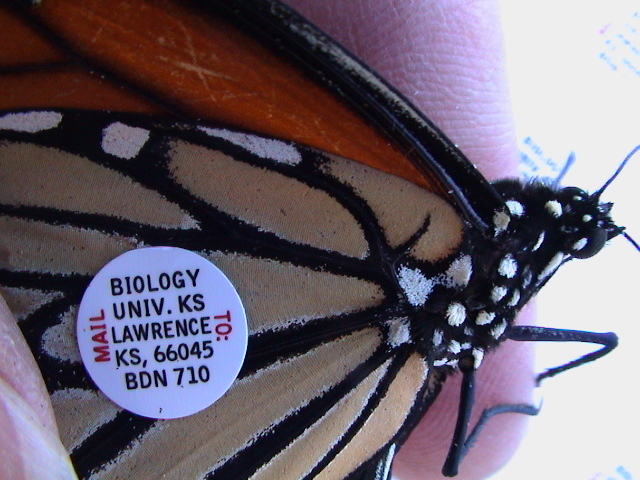 When people find tagged monarchs (either on their breeding grounds anywhere in North America or in the overwintering colonies), they can be reported back to Monarch Watch. This is a continuation of Fred Urquhart's original tagging program which ended in 1992. Monarch Watch also leads many other activities related to outreach, education and conservation. Notably, they promote the planting and certificaiton of Monarch Way Stations (gardens planted to promote monarch conservation) and provide resources for the planting of local milkweeds. Data Availability: Contact Monarch Watch. Also, Monarch Watch manages the original tagging data from the Insect Migration Association. Protocol Notes: Volunteers capture or rear monarchs, tag them and recaptured tags are reported back to Monarch Watch.